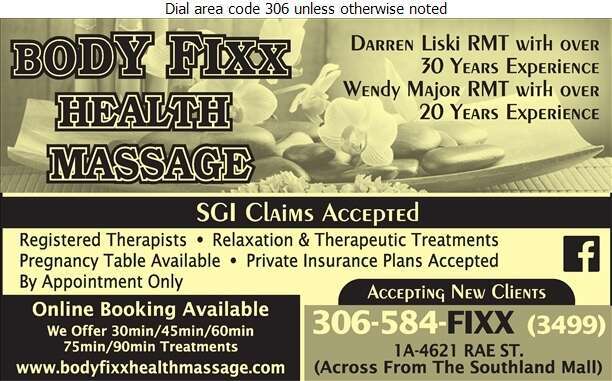 Located across from the Southland Mall in Regina, Body Fixx Health Massage is owned and operated by Darren Liski, a registered massage therapist for 30 years. Darren and his team offer relaxation and massage treatments, and pregnancy tables are available. Come in today and experience the benefits of one of our massage treatments including the relief of headaches, migraines, lower back pain, cramping and so much more. Massages can also benefit your emotional well-being by relieving stress, decreasing anxiety, and enhancing your quality of sleep. The professional team at Body Fixx Health Massage will have you feeling and looking your best in no time at all! SGI claims and private insurance plans accepted. New clients are always welcome! Call us or book online today.